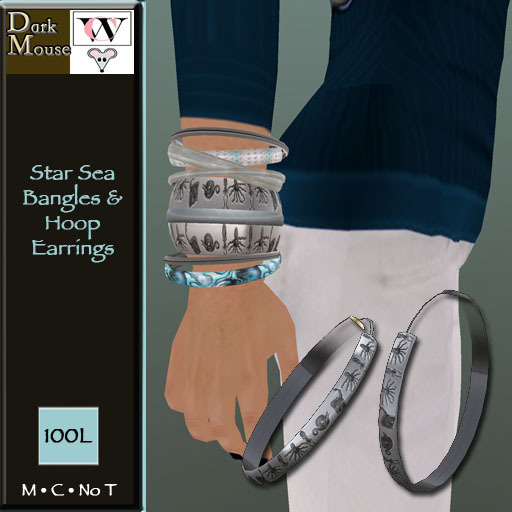 Dark Mouse Jewelry at Secluded Cove! Hi there! In addition to rebuilding my store (I’m DONE!) I’ve also opened another satelite store! It’s in a place I’m honored to share with other really cool designers, all members of the Designers in Seclusion group! 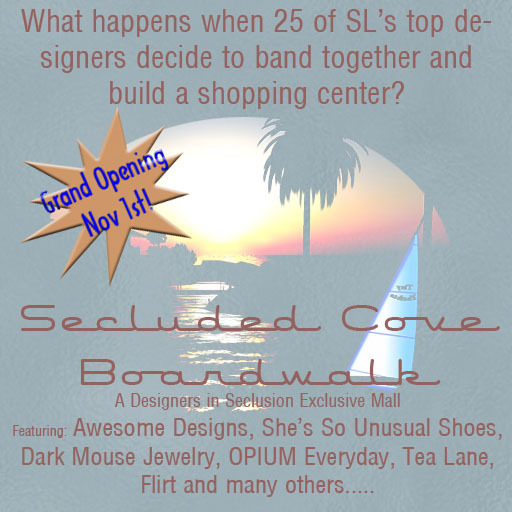 Stop by the mall for the grand opening at 12:00 noon (SLT) on November 1!. Read the press release here! Here’s a slurl to the new mall! Okay this may be a little crazy but….NEW STORE! I’m rebuilding my store. The intention is to separate my two brands, Whimsical Creations Prefab Homes and Furnishings and Dark Mouse Jewelry. I also need more room to expand each brand. I wanted a more unique and clean lined look for both stores and I’m going with a kind of British Colonial Tropical look. Yes, that’s what I’m calling it, I don’t care! I’ve completed building the new stores. I plan to close down the stores at my main location in Taber for about 24 hours either this evening or tomorrow, maybe less if I can finish this quickly enough, but part of the problem is that I also will have to do some heavy duty terra-forming of the land, and it’s not my strong suit. It will require me to remove everything! In the meantime, if you would like to shop at Dark Mouse or Whimsical Creations, please visit anyone of my satelite stores. Here’s a pic of the new store ;-). Empty of course, but not for long! I’ve been wearing this outfit off and on for about 3 weeks now. I love it, it’s something I would wear in RL. I saw Skin Flicks on the feed and bought this immediately and really wanted to show it off – it’s just well – excellent. Best part – the skirt is not weird in any way. Wearing it in-world is a pleasure! The double whammy that got me working on taking pictures was the release of new hair from ETD – finally! I LURVE this hair. I had been going through withdrawal symptons I swear. ermmmm…more new hair please! Credits below the picture! I’ve been working on this project for a bit. I’ve always got about a gadzillion ideas rolling around in my head at once, and the challenge is to finish one before I’m distracted by another! In RL I’m a vintage jewelry junky. I pretty much spend my free non SL® time trolling around antique shops for vintage stuff. Lately I’ve been interested in jewelry that is not only old, but looks, well, used. Tarnished. It led to this idea that I would like some jewelry pieces with semi-precious stones and tarnished metal. Of course, then I had to make textures to go with it. And then I had to futz with the stone textures for a while, as my first attempts at onyx were not to my satisfaction. Then of course I had to actually build the pieces. I wanted statement pieces, something I would wear myself if I were going out for a Christmas party or New Years Eve. I came up with this set – I’m calling it ‘Tarnished’ for obvious reasons ;-). Each set features a matching necklace, earrings, bracelets and cocktail ring. The necklace has a dropped pendant and the earrings have vintagey screwbacks. I’ve made sets in tarnished silver with lapis stone, tarnished gold and onyx and copper and red opal. I think these sets are unique and special…I really hope you do too! I’m doing something a little different with the sets this time round, you’ll be able to buy the pieces individually OR as a set at a reduced bargain price. You can get a closer view at my main store, here’s a slurl to teleport there directly! Hi there – I made this lovely sofa set for my new store build when I had the grand re-opening a few months back. It’s a lovely set – I call it my Pink & Brown Squishy Sofa Set – it’s copy / mod like all my furniture! It features 2 poses (different) on each sofa and comes with a matching coffee table. I’ve decided to put the set on sale for $25L. That’s two sofas and a coffee table for $25L. Stop by today and pick one up! It’s copy/mod, so you can change out the poses, etc…Stop by and pick up a set today – here’s the slurl to my store! Okay so I love brown. I especially love brown with blue or pink. While it’s not called brown…..I saw this Big Booty, Big Money Inside Dress in orange at the BBBM store in Retrology, and even though I swear – I am not a dress person – I had to have it. It’s awesome. Look at the skirt! It’s gorgeous, look at it! I paired it with a great freebie sweater in teal from Thimbles but I’m not sure it’s still available, and free teal tights from Shiny Things. I dug a pair of my favorite shoes out of my inventory, the Clomps in brown from Adam and Eve. My hair is ETD Bonita in Strawberry Burnt, which is another awesome freebie, my skin is Curio, Lumine Perse Frex. Poses by Lap and jewelry is my own Heart Charms from Dark Mouse Jewelry and the glasses are well, me ;-). OH! Why was I in Retrology – well I was getting my little shop there ready for the big Halloween Pumpkin Hunt that will be starting on Friday at midnight SLT. Don’t miss it! I’m feeling in the pink today, so I put together this outfit. ❤ Cupcakes. I was shopping last week (okay when I’m not shopping, I’m building lol), and succumbed to the charm of the Enchant Dress in pink. When I wanted to wear it, I could not find it in my inventory, so I ported over to Cupcakes to remind myself of the name and stumbled on to their hunt! Tp there now! I’ll confess I was thinking that I wanted something sweet to go with my own Dark Mouse Glowy Baubles Necklace and this was pretty much it. I settled on my Hailey hair (Dark Blond/white tip) from Tousled which I think I’m addicted to! I finished it off with the Dark Mouse Strappy Sandals that I contributed to the freebie table at the Juicy Del Mar sim for Juicy’s Birthday (all pink all the time!). My skin is Curio Fresh – Lumine Lavender Frex, poses are Lap! 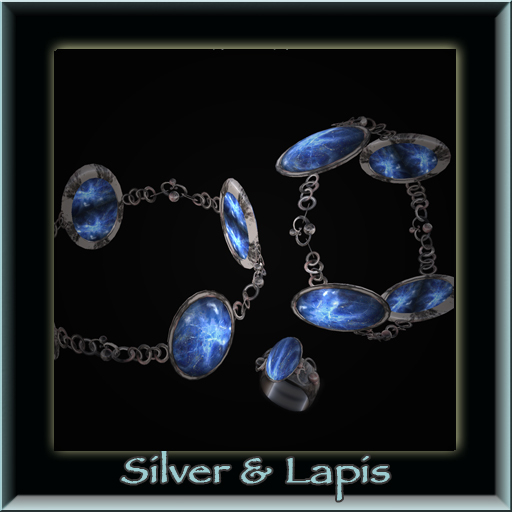 I also wanted to take a minute to thank Miriel Enfield for all her hard work on the Jewelry Expo – it was a great event and I was honored to have my stuff sitting in with all the great jewelers of SL®. I was also really pleased that my auction contribution was bid on! Thank you to whomever purchased it! The expo ends today, so tp there now! Sooooo – I have some releases and can’t come up with any pithy remarks for my post so I’m just showing what I got! 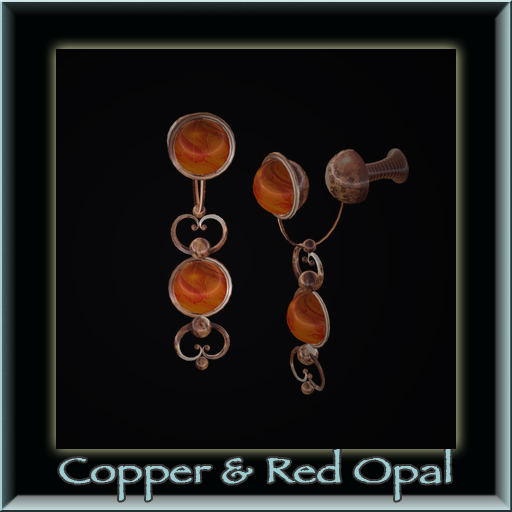 Oh I should mention – all my jewelry sets are available in silver, gold and copper – so you have options. I’m not showing all colors cause I don’t want to overwhelm the feed! So stop by at the store! Also – check out my new branch store at Amicitia – one of the most lovely and charming shopping areas in SL®. Also – don’t forget – nothing but cool stuff still available at the jewelry expo – including the great pearls that I’m wearing in my squeee! Closet Crisis Guest Submission – they are FREE! 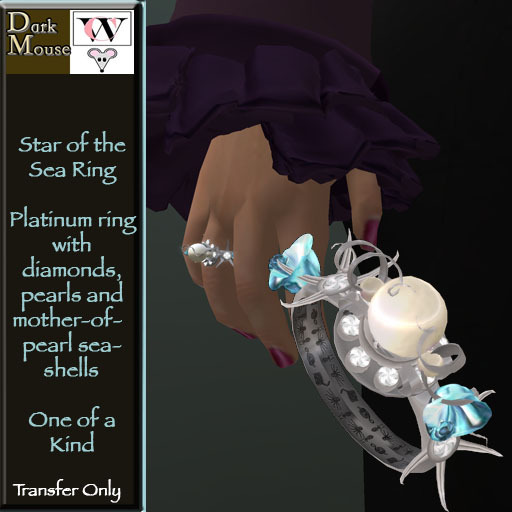 Dark Mouse at Jewelry Expo! I’m thrilled to be participating in the Jewelry Expo – which is not just a great a opportunity to look at the best creations of the jewelers in Second Life®, it’s also an opportunity to help out a great charity, Heifer International. I’ve been making myself crazy working on it, as it’s my first expo. I’ll be participating in the auction (take pity on me, bid on the piece I made!!!). I made a lovely ring for the auction – it’s one of a kind – I’ll never sell it in the store or make it in a different color, etc. I’m calling it the Star of the Sea Ring. I also have a dead useful freebie in the booth – which you’ll only be able to get at the expo – my vibrant beads in pearl. And last but not least – there’s a treasure hunt at the expo…be on the lookout for a lovely set of bangles and hoop earrings – Sea Diamond Bangles and Earrings set! I’ve got some items on a charity table in the center of the booth – 50% of the proceeds will go to Heifer. Have fun – check out all the great jewelers and get some great stuff! Here’s a slurl to get there! Dead Fish? Glowy Baubles? Pearl Crosses and 80’s Bangles? Yeah that’s right, all over the map. I’ve been working simultaneously on several different things that are all completely different! So what else is new? I was chatting with a friend, and she requested a Dead Fish necklace (it’s always odd to think what will inspire you), so there you go. I was definitely channeling Taran and Eilonwy when I made the Glowy Baubles set – a very showy piece that comes in some lovely colors. I was experimenting with prims and accidentally made the Pearl Cross set. Then I decided to make some plaid bangles – I’ll confess to go with all the plaid stuff I was seeing on the feed. Quite a mixed bag! Oh if you STILL have not joined my group – go now! Here’s a tp to the store! Oh and don’t forget – JEWELRY EXPO in just a few more days!! !